Love, Simon was released in the UK on the 6th April 2018 and is the only romcom I would happily watch again. 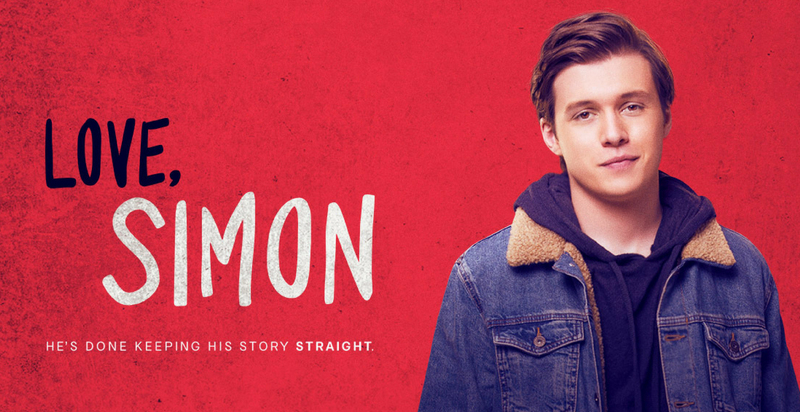 Love, Simon is brilliant it’s sweet, funny and I think perfectly captures the awkwardness of high school crushes. This is encapsulated as Simon shouts an awkward compliment at a hot guy, gets in his car and hits his head against the steering wheel causing the horn to go off, adding insult to injury. But, the cute romcom isn’t the main part of this movie. The main part is the inclusion; a gay main character, people of colour (POC) playing major parts, an out POC gay boy and (spoiler alert) a gay POC Jewish boy! Admittedly there is still some way to go for better inclusion, but this is definitely a big deal. The overall story is Simon finds out there is a gay kid in his school on a social media site who is writing by the pen name “Blue”. They start talking, but, another kid finds the emails and threatens to go public with them. Love, Simon is incredibly idealistic. Other than a few bullies at the school and the guy threatening him, no one is a huge bigot. Although the head teacher in the film is a wonderful example of the quieter form of homophobia, where he is fearful of being seen as gay and assumes that the two gay kids in the school simply have to be boyfriends. Inclusion for LGBT+ and POC in movies still has a long way to go, but this is a definite and amazing step in the right direction!